Genuine Fiskars Spare Parts to keep your garden tools in perfect working order. 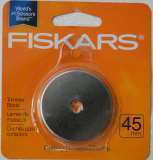 Suits: Fiskars L77 Garden & Abattoir Anvil Lopper - model 112580 (no longer available in Australia) 500g Shipping Fee ($6.95) for this item alone. Genuine Fiskars Spare Parts to keep your garden tools in perfect working order. Suits: Lopper - model 112380 (as shown in MORE VIEWS above) Lopper - model 112480 (longer 80cm version) 500g Shipping Fee($6.95) for this item alone. Founded in 1649, Fiskars is Finland's oldest company. Genuine Fiskars Spare Parts to keep your garden tools in perfect working order. Suits: Fiskars Anvil Pruner P91 - model 111510 500g Shipping Fee($6.95) for this item alone. Genuine Fiskars Spare Parts to keep your garden tools in perfect working order. Suits: Fiskars Power-lever Telescopic Lopper - 91686935 Dimensions:Blade length: 160mmHole centres: 75mm 500g Shipping Fee($6.95) for this item alone.